We enjoyed our last morning in town and bought some fruit at the market. After lunch we hired a taxi to the airport. 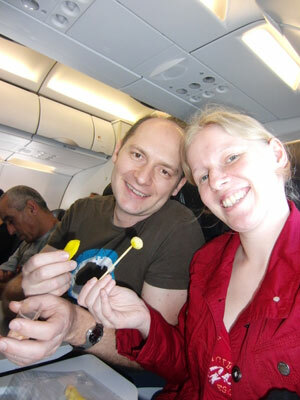 On the plane we ate what we took for some unknown fruit. Later we found out that it were pickled vegetables, which was rather unexpected. However, with the packed sugar-chili-mix it was quite tasty. From Phuket airport we took a taxi to Bang Rong Pier for the ferry to Koh Yao Noi. We still had a few minutes until departure so we bought 2 curries in a rather dingy warehouse, but the food was delicious and spicy. The boat trip took about half an hour and on the way we got our first impressions of the Phang Nga Bay. 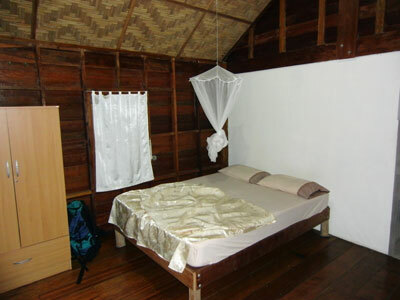 Koh Yao Noi is one of the lesser developed islands in the area with a predominantly Muslim population. Fishing and rubber planting still remain the main occupations. We could recognise a considerably higher price level especially with transport and food costs. This might be due to the generally higher price level of Phuket island being a major tourist destination but this is also true - to a lesser extent - for the smaller islands, since almost everything has to be shuttled there by boat. However, prices are still very reasonable compared to western standards. 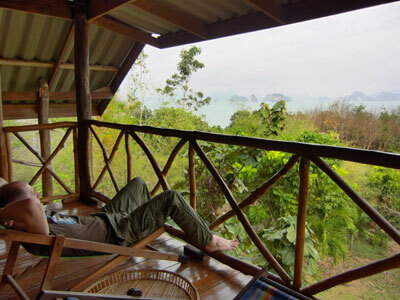 After calling in at Koh Yao Yai we finally arrived at Koh Yao Noi. A couple of taxis and songthaews were already waiting for customers, and so we were at our guest house Tabeak View Point shortly after. The small resort is built against a hill overlooking Phang Nga Bay and consists of 8 bungalows in two rows and an open-air restaurant. After a friendly welcome we enjoyed the amazing views from the terrace of our bungalow.